The 5.8GHz/433Mbps is perfect for HD video streaming and online gaming, while 2.4G/150Mbps is enough for web surfing and online chatting. Install the driver from the included CD or download driver from http://bit.ly/2qLS37h to install(No drivers required for Windows 10),then plug and paly. 2. 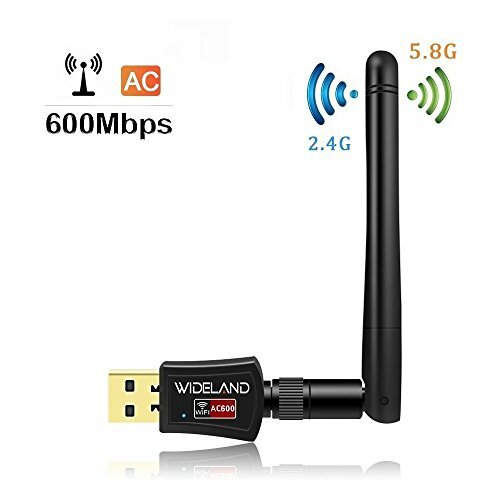 This wifi adapter could not boost the speed of original router, it just transmit the wifi signal,Therefore, the speed of the adapter cannot overpass the entire bandwidth of your broadband connection. many obstacles between usb wifi adapter and router, then you will get a better signal under 2.4 GHz. ★External Powerful Antenna:High Gain Long-Range Antenna can help you connect even when signals are weak. ★Plug-and-Play:Setup CD included; Once you've run the software, you can simply insert the adapter to get connected (No drivers required for Windows 10,Attention:please don't install cd driver for win 10, you need just plug and play. the indicator light is flashing means works well. if you are the Mac OS X 10.12, please use the Mac OS X 10.6-10.11 driver in CD to install . ).